If you read the multichannel marketing literature, you're unlikely to find any discussion about how marketing channels truly interact with each other. And that's a shame, because the interactions are where all of the magic happens! Folks who test different combinations of catalog mailings and e-mail campaigns observe interesting results. Take a look at the table in this post. Seven different combinations of catalog mailings were tested against five different combinations of e-mail campaigns, yielding thirty-five different test groups. The organic percentage can be directly calculated ... the $20.00 generated at 0 catalogs / 0 e-mails divided by the $99.00 generated at 24 catalogs / 52 e-mail campaigns. The organic percentage is 20.2%. This is soooooooooo important!! If this company does nothing, customers will still spend 20.2% of the volume they spend if all direct marketing activities are executed. For most catalogers and e-mail marketers, results are over-stated, because organic demand is being falsely attributed to marketing activities. Ask your co-op or database provider to calculate the organic percentage for you, or ask your database marketing expert to calculate this metric for you. Notice that demand does not increase in a linear manner. Each additional catalog, and each additional e-mail campaign yield an ever-decreasing amount of additional demand. This rate of diminishing returns is not well known in the direct marketing community, and causes direct marketers to significantly over-invest in marketing. Notice that e-mail is able to re-capture demand that is lost as catalog mailings are reduced. This "re-capture" is not well known in the direct marketing community, and causes direct marketers to significantly over-invest in catalog marketing. E-Mail marketing is actually very productive at small quantities ... thirteen contacts are much more productive, on a per-e-mail basis, than are fifty-two contacts. As catalogs and e-mail campaigns are increased, profit begins to shift. Notice that the most profitable combination is 12 catalogs and 52 e-mail campaigns. 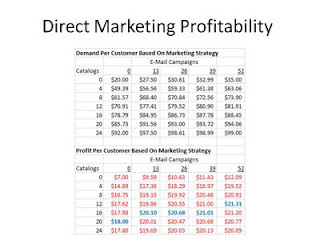 However, if you only delivered 26 e-mail campaigns, you need 16 catalogs to maximize profit, and if you don't execute e-mail marketing, you need 20 catalogs to maximize profitability. "Profit Shift" is a very important concept. As more and more "free" or "nearly free" marketing channels become available, the profitability of traditional, expensive marketing channels (like catalog marketing) becomes worse, requiring less investment in traditional, expensive marketing. When e-mail marketing and catalog marketing collide, a rich array of insights become immediately apparent. All you have to do is set up tests to identify the insights!